During the weekend the New York Yankees won another series as they took down the Toronto Blue Jays by winning two of three on the road. In their last 23 series the Bronx Bombers are 19-2-2 and now they look to capitalize on a Baltimore Orioles struggling team as they head to Camden Yards for a four-game set. The Yankees young core has shown the ability to produce, while veteran Brett Gardner has proven that he still has a lot of gas left in the tank. He was vital in the series win over the Blue Jays. On Saturday he blasted his 14th career leadoff home run and third of the season, but more importantly, the veteran still has the ability to produce in clutch situations as five of his six home runs this season have either tied the game or given the Yankees the lead. Veteran pitcher C.C Sabathia will kick off the series against the Orioles. He will face the Orioles right-hander Jimmy Yacabonis in game 1 of Monday’s doubleheader. 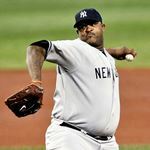 Sabathia will try to continue his superb work of late as in his last seven outings he’s pitched to a 2.47 ERA while striking out 37 batters. In game 2 of Monday’s doubleheader, the Yankees will use Luis Cessa against former Yankees prospect Yefry Ramirez. Cessa (0-1) has just one start under his belt this season and a career ERA of 4.72 as a starter, while Ramirez ERA is 2.51 but has a 0-2 record this season. Masahiro Tanaka returns from the DL and will start the third game. He will go head-to-head with the Orioles’ right-handed pitcher Andrew Cashner. This will be Tanaka’s first start since June 8. Tanaka has already faced Baltimore twice this season and has struck out 14 Orioles and walked just one. Sonny Gray will close the series on Wednesday as he faces off against Dylan Bundy. Although Gray has struggled as of late he’ll look to repeat his last outing against Baltimore, when he picked up the win after pitching six innings and allowing just one run.